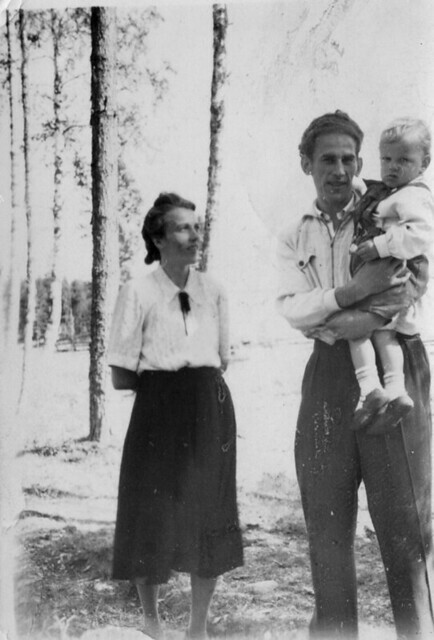 My grandmother passed away last Friday, and the world is all the poorer for it. While her death wasn't completely unexpected, she was 90 and had been in poor health after all, it was rather sudden and we are all still reeling a bit from it. I've been trying to write a about this for days, but I find myself quite at a loss for words. I want to tell you all about how wonderful, how talented and creative and inspiring my gran was. I've written about her here before a few times, yet now I am unable to find the words to do so. So, I just want to say that the world has lost an amazing woman, who will be dearly missed. I'd like to share something from my childhood that's inspired me in making soft toys. 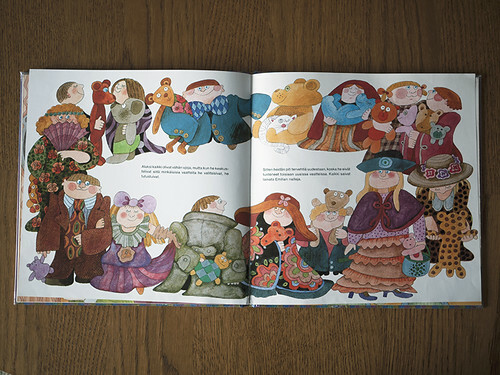 "Emilia ja kolme pikkuista tätiä" (Emilia and the three little ladies) by Camilla Mickwitz was one of my favourite books when I was little, and well, I still like it a whole lot! It's the story of three little old ladies who decide to throw a party for kids in their neighbourhood. They make costumes and yummy treats and teddy bears for their little guests. "Emilia sewed teddy bears. A lot of bears. Big and little, tall and short, chequered and stripy, dotty and floral." This page has stuck with me since I was a kid. 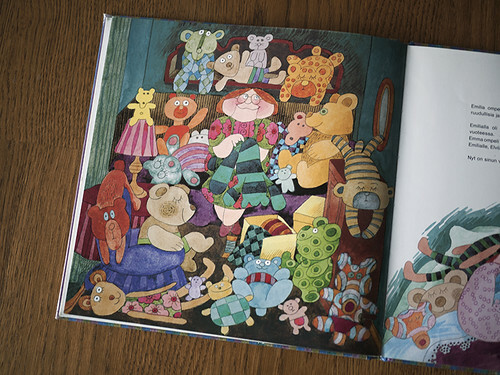 The little old lady surrounded by all those wonderful teddy bears was something I wanted to aspire to myself too, to make so many bears they'd fill a room! I would love to throw a fancy dress party with tea and cakes and soft toys for all of you! It'd be so much fun! We'd dress up, have biscuits and cake and tea, and play with plushies. Today is ひなまつり, Hinamatsuri, Doll Festival or Girls' Day, as it's also known. Originally on Hinamatsuri people floated straw dolls believed to carry bad spirits and worries away down the river and into the sea. Now days in addition to it's traditional hina-doll displays to ensure daughters marry, it's become a day for celebrating all things girly and dolly as well, and it's my most favourite of all the matsuri, Japanese festivals! Of course, Japanese festivals aren't really celebrated here in Finland, but I still like to mark them none the less. 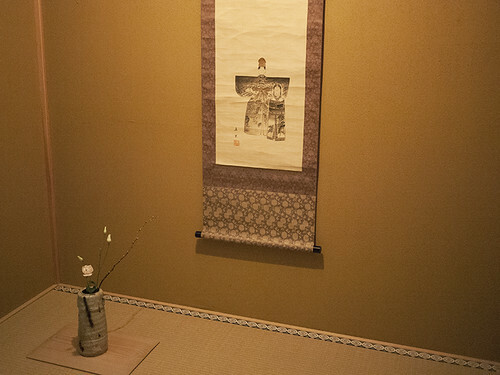 We held a Hinamatsuri tea gathering at the tearoom last Saturday, and it was really lovely, even if I say so myself (I was in charge of organising it). Everything was doll-themed and I hope our guests had as wonderful a time as us hosts did with it! 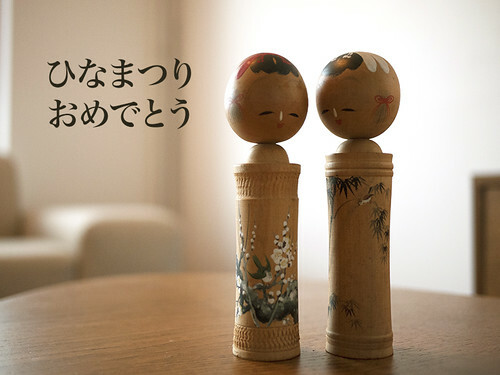 I wish a very happy Hinamatsuri to every girl and doll!